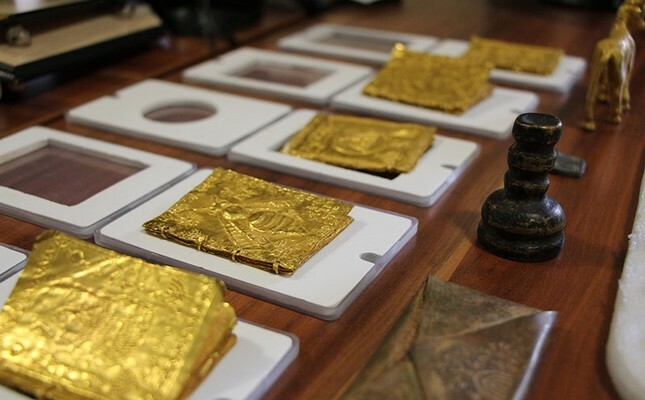 Acting upon a tip off, gendarmerie units raided a house in the Hamamözü district of central Amasya province, seizing 11 historical artifacts and detaining a suspected smuggler. One of the items found in the house was a bronze seal which was initially thought to belong to King Solomon. The rest of the items included two five-page and three four-page golden tablets, a golden bull figurine and a bronze charm, all with inscriptions and signs in Hebrew, a six-page metal tablet thought to be a Torah and two metal tablets believed to be amulet holders. Amasya Governor Osman Varol said Tuesday that initial examinations indicated that the items were ancient artifacts, but the exact historical period of the items would be determined after further examination by experts. The items were delivered to the Amasya Museum Directorate for detailed analysis. The experts concluded their examination Wednesday and found out that all items belonged to the Middle Ages. Officials from the Ministry of Culture and Tourism stated that they are following the judicial procedure closely, and the artifacts will be exhibited in the museum following the conclusion of the examination. An investigation is underway into how the suspected smuggler came into possession of the artifacts. Authorities recently stepped up efforts against artifact smuggling, especially from neighboring Syria where the ongoing lawlessness has benefited smugglers. Police on Monday confiscated a Byzantine-era Bible in capital Ankara from a Syrian suspect who was caught trying to smuggle the artifact worth about $1.5 million abroad.